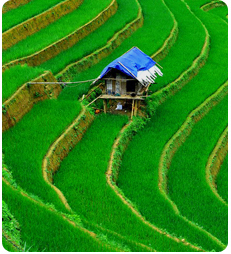 Hanoi, Pu Luong, Black River, Son La, Lai Chau, Phong Tho, Sapa, Hanoi. 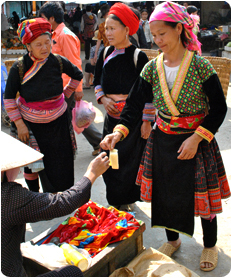 North West Vietnam offers intriguing and beautiful cultures, spectacular sceneries, wonderful people and lots of things to do. 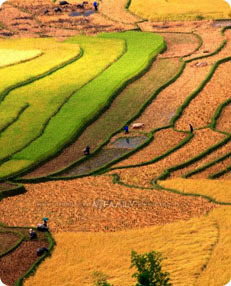 We hike through particularly picturesque areas, cycle around beautiful villages, kayak along the splendid Black River and are guests in small White Thai, Muong and Zay villages. Come with us to discover all on this journey! 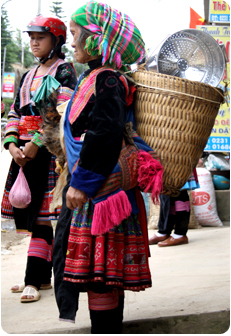 The Pu Luong Nature Reserve is an area of outstanding beauty, cultural interest and high biodiversity value stretching from Mai Chau, in the north west, to Cuc Phuong National Park, in the south east. 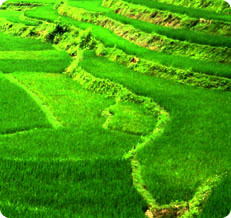 The region is blessed with rich forest, limestone panoramas, magnificent rice terraces and breathtaking scenery. 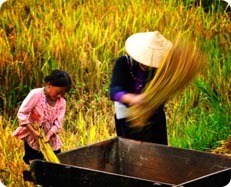 Departing from Hanoi we drive to Mai Chau and upon arrival we hike to the Thai village of Hang, situated in a beautiful valley and home to White Thai people, we get to know a local White Thai family, relax in the cool climate, enjoy their hospitality and culture over our dinner. We spend the memorable night in their traditional wooden-stilt house. (Lunch and dinner are included). This morning we have the opportunity to stroll around Hang village before we start hiking. The scenery is simply awesome. We hike for approximately a couple of hours. Along the way we pass through several Thai and Muong villages. 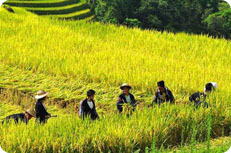 This is followed by a leisurely bicycle ride through the spectacular area, before arriving at the Black River for our leisurely boat ride along this beautiful river, which is essential for providing water to North Vietnam’s largest hydro-electric power station as well as fishing and agriculture. 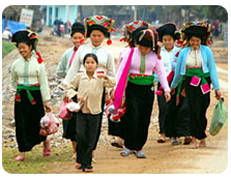 We then approach Xom Moi village, situated by the river and home to Muong people. The night is spent in their traditional stilt-house, giving us the opportunity to experience their way of life. (Breakfast, lunch and dinner are included). The day begins with a beautiful kayaking ride along this river, we appreciate the perfect panoramas and we meet the local people who fish on the river. 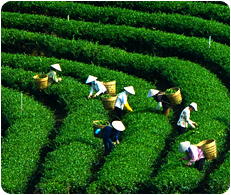 This is followed by an enjoyable drive to Son La, passing through tea plantations, hills and mountains. En route we stop to visit a local market and walk around some small villages, home to Black Thai people. Arriving in Son La there is some free time in the township. At night we stay over in a comfortable hotel. (Breakfast, lunch and dinner are included). We continue our journey due south to Lai Chau province by car, viewing spectacular mountain scenery, before arriving at Lai Chau, a peaceful place surrounded by mountains, hills and villages. There is plenty of time to enjoy this area's laid-back atmosphere. We take a beautiful walk into nearby villages. We retire to a comfortable hotel for a good night's rest. (Breakfast, lunch and dinner are included). 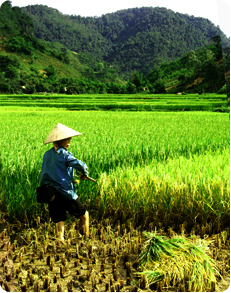 Limestone mountains, verdant hills and spectacular valleys in Pu Dao are our base for soaking up breathtaking scenery and learning about their way of life. 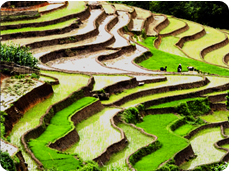 We explore the beautiful hiking trails and pass through different villages, lush rice fields and magical valleys with stops to meet the local people. 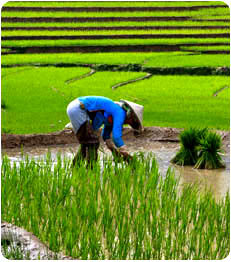 Arriving in Phong Tho for some free time in a local market and enjoy our overnight stay in a charming hotel. (Breakfast, lunch and dinner are included). 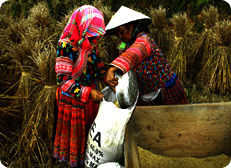 In the morning we journey to Sapa. Upon our arrival at tiny villages of Sin Chai and O Qui Ho. 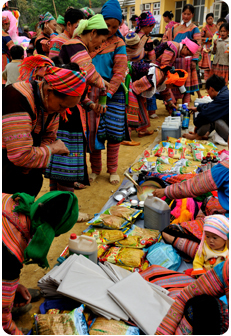 The Sin Chai and O Qui Ho are situated in a region of beautiful rice terraces and home to Black H’mong people. 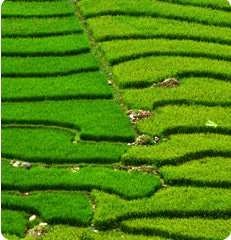 From here we set off to hike through lush rice terraces and along verdant hills at an easy and leisurely pace to suit everybody. At night we stay over in a comfortable hotel. (Breakfast and lunch are included). 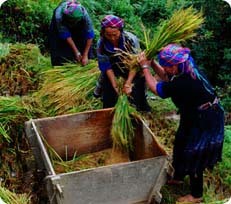 We depart from Sapa and enjoy a hike to the nearby villages of Sa Seng and Hau Thao, set in a spectacular beautiful valley and home to Black H'mong, Zay and Dao people. 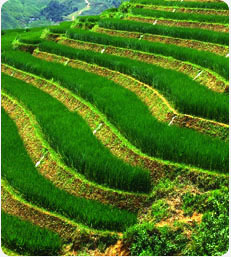 We hike along a footpath amid sculpted rice terraces and past friendly villages. En route we share fun with the local farmers at work as they tend their seasonal crops. 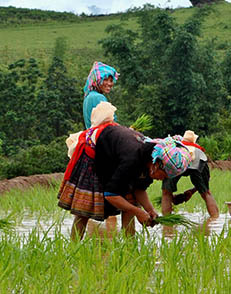 Late in the afternoon we descend to the village of Giang Ta Chai, nested in a picturesque region and inhabited by Zay people. 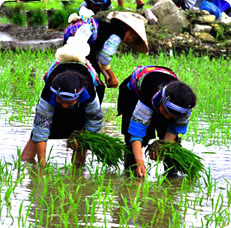 Zay people are adept ar rice cultivation and are responsible for tending to the rice manicured terraces that stretch as far as the eye can see. Tonight we spend a memorable night in the traditional stilt-house of a Zay family. (Breakfast, lunch and dinner are included). 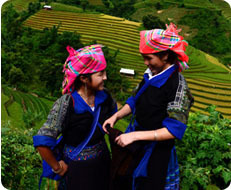 Ma Tra and Ta Phin offer a blend of dramatic mountains, lush fertile hills and colourful Red Dao and Blue H’mong people. 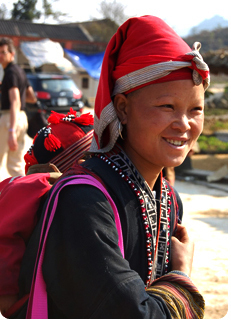 Red Dao women here are particularly striking, with their coin and jewelllery-studded turbans and shaved eyebrows. 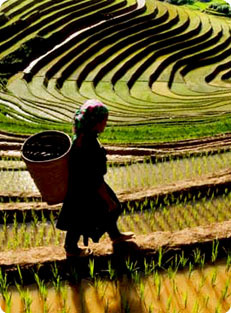 We hike through more stunning countryside and meet friendly Blue H’mong and Red Dao people. This is followed by a short transfer to Lao Cai for the sleeper train back to Hanoi, arriving there at 4h30 the following day. (Breakfast, lunch and dinner are included). - an 8-10 km hike on Day 1. - a 12-15 km hike on Day 2. - a 7-10 km walk on Day 3. - a 2-4 km walk on Day 4. - a 12-15 km hike on Day 5. - a 5-6 km hike on Day 6. - a 12-15 km hike on Day 7. - a 9-12 km hike on Day 8. Our Tour Guides are experienced and friendly. They speak fluent English. - 3 nights in local homes. - 1 night on an overnight train. - 4 nights in hotels. - $598USD per person for a group of 2 to 5 people. - $529USD per person for a group of 6 to 8 people. Pack essentials, including light comfortable clothes suitable for outdoor activities, walking shoes, small day pack for cycling, walking, hiking and trekking.